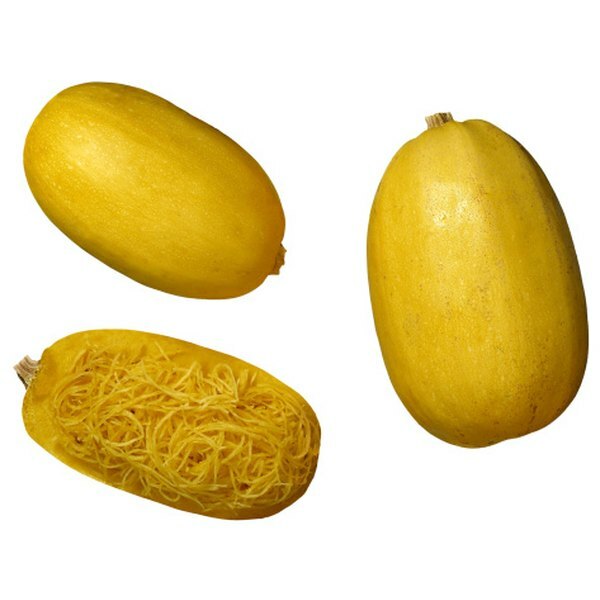 Bake spaghetti squash and create a main or side dish with meat, veggies or cheese. 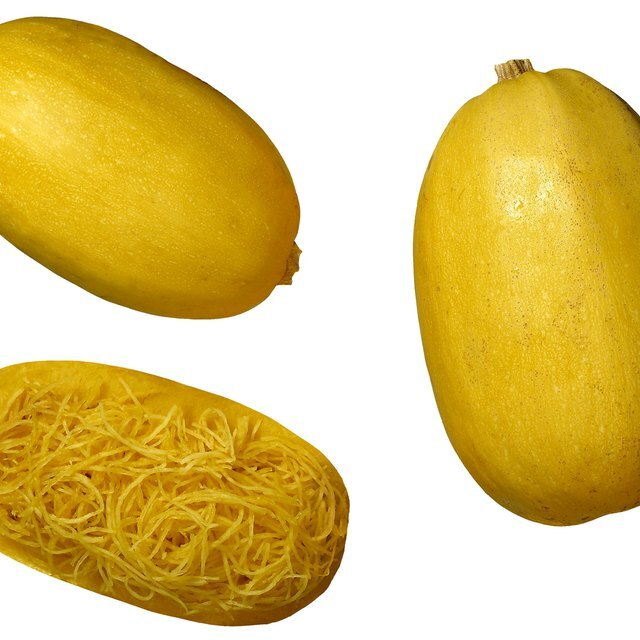 Choose spaghetti squash that is firm. Preparing it in the oven is the handiest cooking method since it cooks slow and with its own steam. Bake it whole at 200 degrees Fahrenheit for about 90 minutes by first piercing its skin several times with a fork and covering with aluminum foil. Otherwise, bake in 30 minutes at 200 degrees Fahrenheit by cutting it in bite-size pieces then sprinkling with olive oil, salt and pepper. Recreate spaghetti and meatballs with spaghetti squash. Use low-fat ground turkey for the meatballs and bake rather than fry. Chicken-lovers will adore making chicken kebabs. Buy pearl onions and layer the kebab stick with bite-size pieces of chicken, onion and spaghetti squash. These can be either baked or grilled and served with desired sauces, such as teriyaki. Create an entire meal with spaghetti squash and other substantial vegetables. Choose a variety of veggies that cook at the same temperature together and are a variety of colors. More colors among veggies indicates more vitamins and minerals. Make a veggie lasagna with layers of eggplant, grated spaghetti squash, onion, fresh tomatoes, Parmesan cheese and mozzarella cheese. This squash is highly flexible as it can be prepared with cheese. Serve it as spaghetti, mixed with olives, a few capers, tomato sauce and thick slices of fresh mozzarella. Make a goat cheese and squash side dish by baking the squash in the oven with zucchini and rosemary, then serving with goat cheese and a toasted French baguette. Smooth legumes pair ideally with spaghetti squash as an entire dinner or as a hearty winter side dish. Prepare perfect legumes by first sauteing a small yellow onion with a generous amount of olive oil until the onions are translucent. Then, prepare the legume of choice as desired in the same pot and drain excess water when finished. Separately bake the spaghetti squash as desired and when ready, mix together. Cecilia Vegattoni began writing in 1989, specializing in finance, organization tips, cooking, knitting, running and travel. She also has professional experience as a finance manager. Vegattoni holds a Master of Science in library science from the University of Maryland, College Park, and a Bachelor of Arts in English writing from Towson University. How Do I Make Roasted Chicken Breast & Vegetables?